We all know, all to well, that most of the electronic consumer products marketed by US brands are manufactured in China. The Chinese do a pretty good job manufacturing the devices and Americans do a pretty good job of documenting, market research, marketing and, in many cases, directing or influencing aspects of the design to make the product functionality best suit American markets. What is interesting is to examine, in detail, products in which all aspects are Chinese produced including the marketing, marketing, documentation and user interface design (usability). Recently, I obtained one such Chinese product – what they call a “GSM Auto-Dial Alarm System”. Doesn’t that catchy name just make you want to buy it? 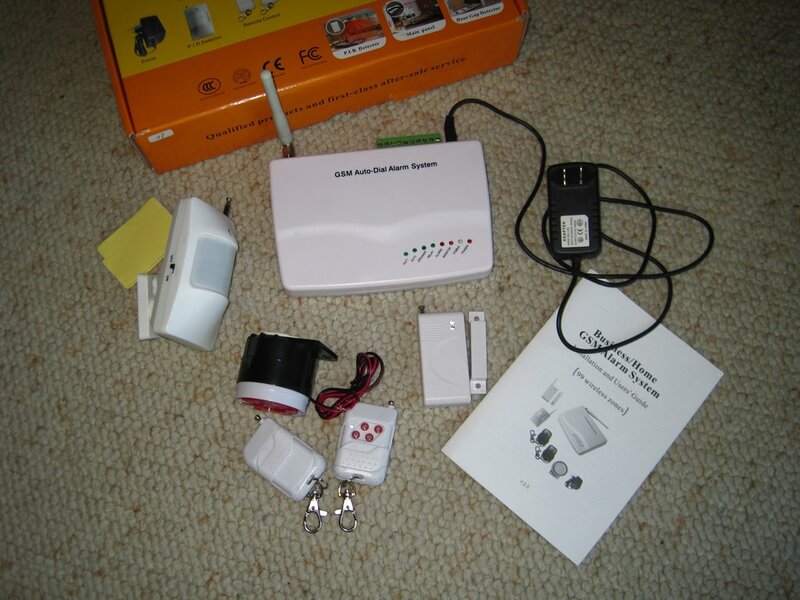 The “GSM Auto-Dial Alarm System” is an inexpensive burglar alarm system for Do-it-Yourself home/apartment installation. The version that I obtained is best for an apartment given its limited included sensors. By inexpensive – I paid about $50, including shipping, and I plan on selling it back on eBay at, hopefully, a higher price because I will be adding some better documentation and a GSM SIM card, which did not come with the original purchase. A traditional home burglar/security alarm system calls a professional alarm monitoring center (Central Station) upon an intrusion and then the Central Station calls first your designated number (usually your home or cell phone) and if you don’t answer or don’t indicate that the alarm is false and validate with a secret code, then the Central Station calls the appropriate public safety department for dispatch. The “GSM Auto-Dial Alarm System” functions differently. Upon an intrusion it sends a SMS/TEXT message to your designated cell phone. While the alarm system must use GSM service, the cell phone called does not have to use GSM service. The system would typically be activated/deactivated with a keychain fob, it can also be activated/deactivated with commands sent from your cell phone via SMS/TEXT messages – all passworded, of course. So, with the “GSM Auto-Dial Alarm System” you make the decision about how to handle the event, i.e., call police, ignore, call a neighbor, or whatever. There is also a “Listen-In” feature where you may, optionally, have the system send an SMS message to report the intrusion and then call your phone’s voice channel so that you can listen to sounds that may be picked up by a microphone within the alarm’s controller. I consider this feature to be pretty useless as the controller needs to hidden in a location unlikely to hear any useful sounds. There is also an optional feature where you add a speaker and then you can not only listen to the intruder but also talk back to them. Initial setup is done with passworded SMS/TEXT messages sent from a cell phone. Now, back to my opening comments. 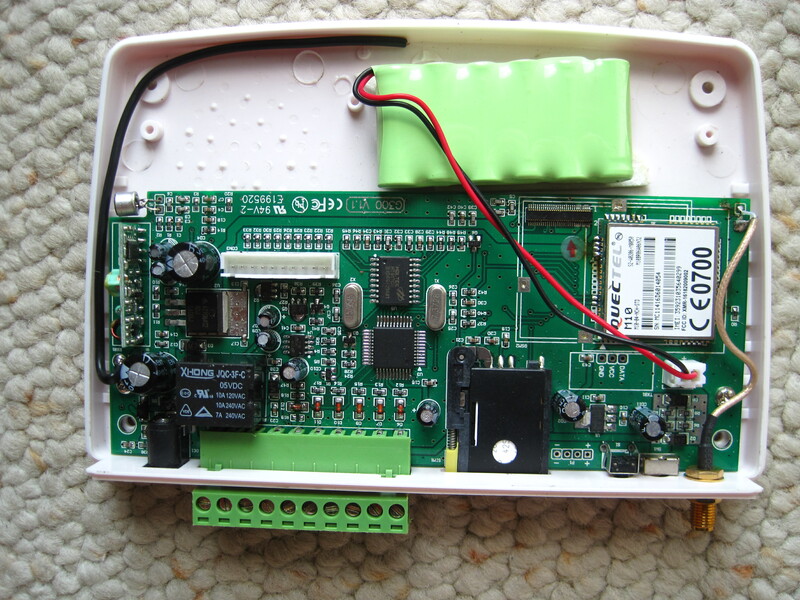 The controller of the alarm system is well made, with good fit and finish and appears to be well engineered. For everything else it is painfully obvious that American marketing was not involved. The sensors, while they work well, are designed with dorky, ugly expendable antennas, similar to 1960s portable radios. My wife would not be very appreciative of one of these sensors on the wall with its antenna extended. While, in my testing, extending was not required for functionality, what were the Chinese thinking? The keychain fobs also have these dorky, ugly expendable antennas which were also not needed in my testing distances of 40-feet. All of the sensors use fixed code technology provided by the PT2262 integrated circuit. The base station does not use the mating PT2272 decoder but, instead, decodes in software. A good explanation of the PT2262 technology is available at the SolidRemote Technologies website. Now the documentation was amazing. Of course it was written in broken English which, in places, requires some create interpretation. The worst part was that is contained glaring errors, including instructions for features not found on this product model, blatant errors, typos and omissions of important instructions. It actually functions quite well. Rather than explain its operation, watch a short YouTube video that I made of the unit in operation, at THIS-LINK. This product illustrates that the Chinese can independently produce a product of acceptable technical quality and execution but fail miserably in usability design, features appropriate for the target audience, usable documentation, etc. I find it amazing that they will put such effort into the technical engineering yet ignore the other equally important parts of the product. Why don’t they hire some Americans to help with the important “user” parts of the product’s design and execution. As long as they operate in this way independently developed Chinese products will not be a threat to American developed products even when the American products are physically made in China. This entry was posted in Electronics, security, SMS, wireless and tagged alarm, GSM, security, sms. Bookmark the permalink.